GAO Yr2014 Report on Offshore Voluntary Disclosure Program Indicates Less Than 4% of Taxpayers Lived Outside the U.S. The GAO has now issued two reports on taxpayers who participated in the Offshore Voluntary Disclosure Programs. See, The 2013 GAO Report of the IRS Offshore Voluntary Disclosure Program, International Tax Journal, CCH Wolters Kluwer, January-February 2014. In addition, the report identified the location of the taxpayers. Not surprisingly, the states with the greatest populations, such as California, New York and Florida had the states with the greatest number of taxpayers participating in the OVD program. There is, however, no direct correlation to the population in those states and the number of OVD filers. How many of these 457 addresses are U.S. citizens living permanently outside the U.S. who are “Accidental Americans”? How many (if any) are LPRs living permanently outside the U.S.? A more comprehensive list of the countries where the accounts were located is listed in Table 2 from this report. 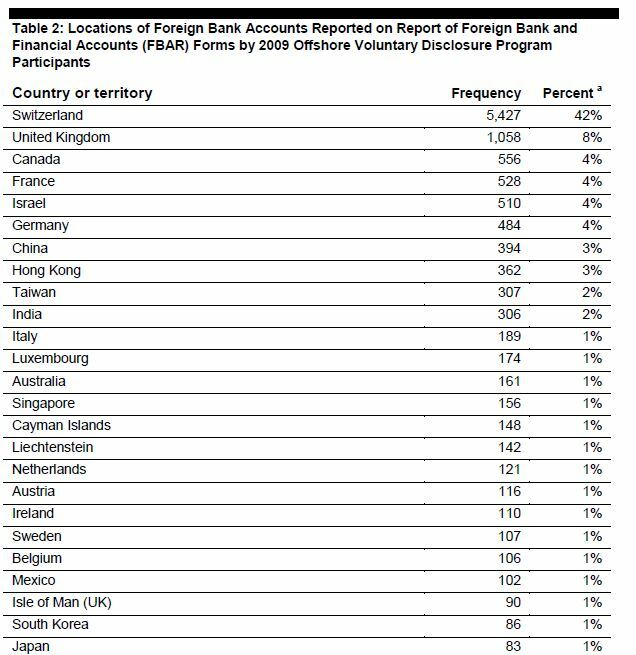 Switzerland dominates the list with 42% of the accounts. See, Is the new government focus on U.S. citizens living outside the U.S. misguided or a glimpse at the new future? – with the Permanent Subcommittee on Investigations focusing primarily on Swiss Banks and Swiss accounts. The UK is number two on the list with 1,058 accounts. Interestingly, Canada is number three on the list with 4%, presumably due to many dual nationals living in Canada. India has only 2% of the accounts reported from this 2009 program, but has become a clear focus of the U.S. federal government. See, U.S. Justice Department Seeks Information on HSBC Customers with Offshore Accounts regarding the John Doe summonses filed with a San Francisco federal judge regarding HSBC accounts in India. In addition, the Criminal Investigation office of the IRS in Northern California reported at the Annual California Tax Bars meeting in October 2013 in San Jose, California, that their office had just received a number of cases from India regarding unreported foreign accounts (part of a nationwide distribution of cases centered in India). 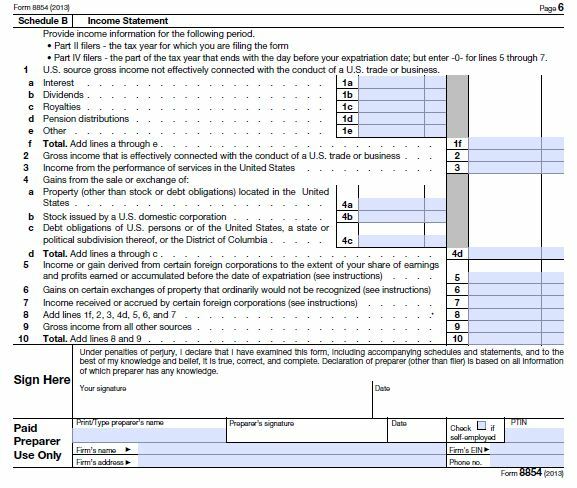 IRS Releases New IRS Form W8-BEN. * U.S. citizens and LPRs beware of completing such form at the request of a third party. 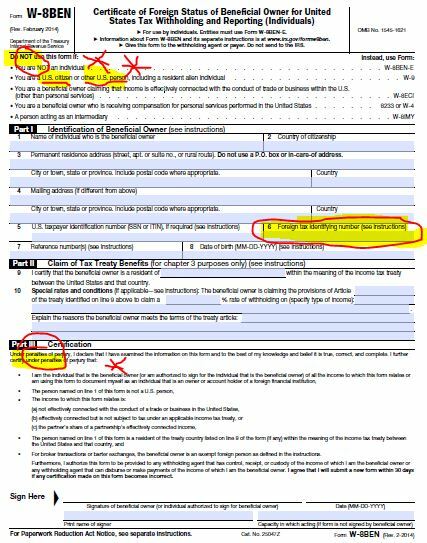 The long awaited revised IRS Form W8-BEN has been released (March 2014). The major changes to IRS Forms W8, particularly W-8BEN-E (which is still in draft form), have been driven by the changes in the law under FATCA. 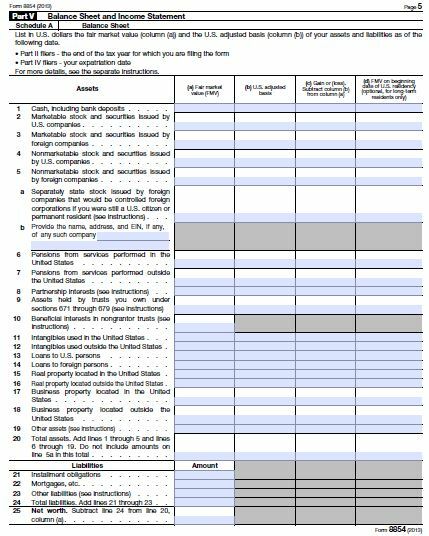 The new IRS Form W-8BEN and its instructions are accessible here. Importantly, no U.S. citizen can legally sign and certify they are NOT a “U.S. person” under U.S. federal tax law. Hence, they cannot sign and complete IRS Form W-8BEN. The form, as is true with all IRS forms, is signed under penalty of perjury. For a discussion of tax crimes of filing false documents see What could be the focal point of IRS Criminal Investigations of Former U.S. Citizens and Lawful Permanent Residents?. 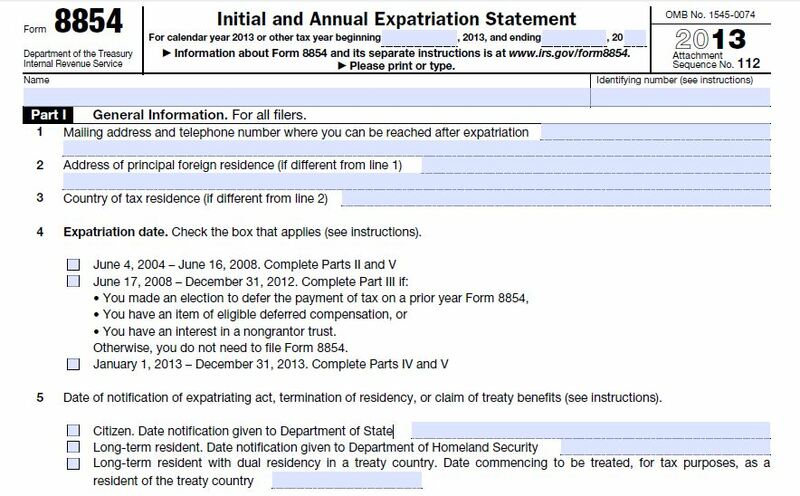 One of the key considerations of this determination is whether the individual lives in the U.S. or is living outside the U.S. in a country which has a U.S. income tax treaty with the U.S. See Oops…Did I “Expatriate” and Never Know It: Lawful Permanent Residents Beware! International Tax Journal, CCH Wolters Kluwer, Jan.-Feb. 2014, Vol. 40 Issue 1, p9. Below is a fairly detailed summary of the type of tax crimes that are commonly investigated by IRS Criminal Investigation (“CI”) agents. As has already been noted, TaxAnalysts reporter Jaime Arora reported in the 3 March 2014, Worldwide Tax Daily certain comments made by Mr. Jeffrey Cooper, who is the deputy director of the IRS Criminal Investigation division’s international operations. It was reported that IRS CI is looking into why people are making the choice to shed their U.S. citizenship; whether it is related to any particular laws. Cooper was quoted at the Federal Bar Association’s Section on Taxation’s 38th Annual Tax Law Conference held on February 28, 2014. TaxAnalysts journalist Arora quoted Cooper as identifying why people are making the choice and “If we find something, we do; if not, we just move on,” he said. It is common policy for the IRS CI not to provide information on how they commence taxpayer investigations, including how they obtain U.S. citizenship renunciation referrals or documents. There could be a number of ways these investigations are commenced. It may be as simple as taking the list from the Quarterly Publication of Individuals, Who Have Chosen to Expatriate – Quarterly Publication of Individuals, Who Have Chosen To Expatriate, as Required by Section 6039G and start reviewing their tax return files (IRS Forms 1040, 8854, etc.) along with FBAR filings. IRS CI tax investigations generally focus on false documents or false statements, evasion of taxation, aiding and abetting of the above along with other related tax and Bank secrecy (Title 31) crimes. There are a host of reporting requirements and factual information that must be provided under Sections 877 and 877A, for all persons (including those with little to no assets), specifically including filing IRS Form 8854 which asks for a “boat load” of asset, income, liability and tax information. A former U.S. citizen or LPR always needs to be careful that the information provided is true, accurate and complete. See Part V of the form. Finally, it is worth noting that the government regularly collects information from internet resources, such as blogs and e-mails as they build a case for criminal prosecution. A former head of the Tax Division at the U.S. Department of Justice once told me that “e-mails and internet communications was God’s gift to prosecutors”. This entry was posted in Criminal Tax Considerations, IRS Audit Techniques - Expatriation, Tax Compliance.